Julia Smith Interview with Bruce Duffie . . . . . . . . .
One of the fascinating things about preparing these interviews for further use on the internet is to see just how far we have come since the conversations took place. 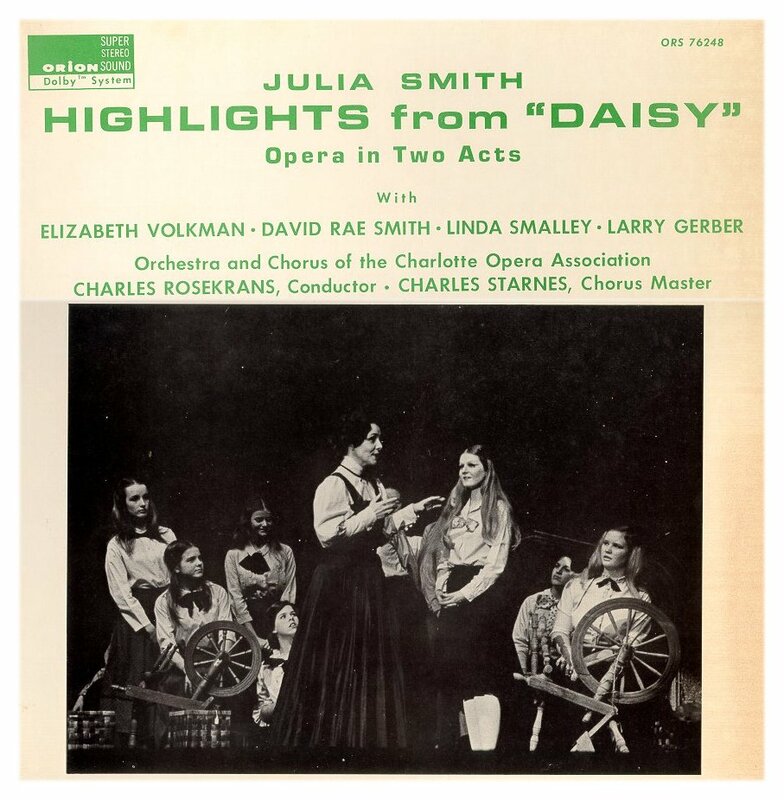 This one, with composer Julia Smith from May of 1987, reveals a penchant on the part of my guest to decry the state of contemporary music in the concerts halls and opera houses. She cites others who feel the same way, and bolsters her argument with personal experience. She indicates what she would do if she was a youngster, and sets out goals and ideals for future generations. Lo and behold, the current state of music a quarter-century later is that we have made great strides in just the directions she had hoped! There are more performances of new pieces in concert halls, and more new operas by American composers being presented at leading opera houses. It must be nice to be correct, and even nicer to have your ideas and ideals become part of the fabric of life. We can hope she is looking down from her Heavenly cloud and smiling on the progress we have made thus far. The photo above is from about 1922. Other items shown within the text include a page from the WNIB Program Guide which lists the presentation of her music, as well as the letter she sent me after seeing the announcement. More details about her life are given in a biographical sketch which appears in the box at the bottom of this webpage. 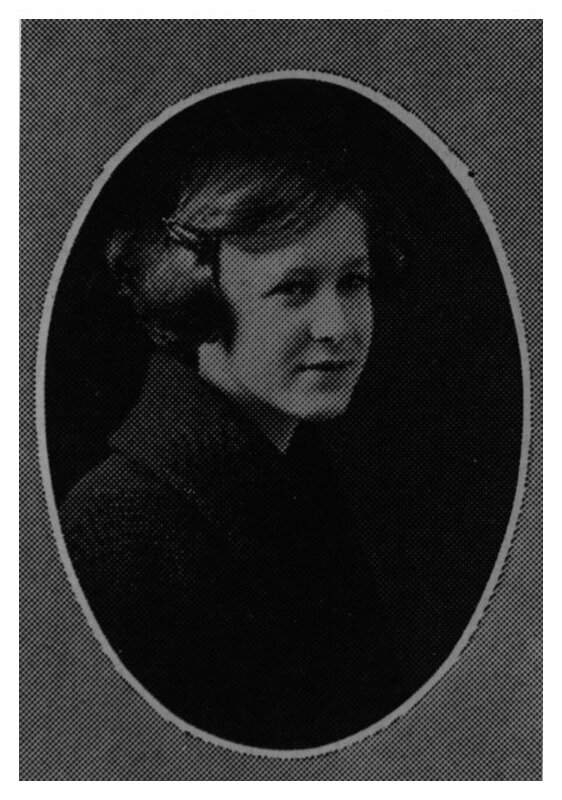 Often traveling to promote her work and the work of other women composers, our appointment was set for a day soon after she had just returned from the Sunshine State and a conference of the National Federation of Music Clubs. Punctuated with much laughter, her responses were informative and enlightening about her own work and that of her colleagues — both male and female. Bruce Duffie: How was your trip to Florida? Julia Smith: It was wonderful and we had a great, great meeting with people from all over the country. I was on a panel with Morton Gould, the President of ASCAP, John LaMontaine and Dr. [Marion Morrey] Richter. They evened things up — two women and two men. That was fair for once! [Both laugh] [See my Interview with Morton Gould, and my Interview with John LaMontaine.] But it was really quite wonderful. BD: I’m glad you had a good trip. You say that it was “fair for once” between men and women. Is the situation not improving a lot these days? JS: Yes, I think so. There are more performances but they’re not big performances. It’s very hard to get a performance with a large orchestra. I had a performance last year with a community orchestra of my Piano Concerto, but those are quite rare! BD: It seems, though, that that’s the lament of all contemporary composers, not just the women but also the men composers. JS: Well, Mr. LaMontaine has had a lot of performances with the Philharmonic and the big orchestras, but the women can’t get a peek in there. Even soloists are hard to get in to play with the Philharmonic or with the Philadelphia. Of course there are too many composers; that’s one thing. BD: There are too many composers today? JS: Yes, and those from Europe get first consideration, even before our men do. That’s what makes it bad. So then when we’re left at the tail end of things. There are no opportunities. The colleges and universities are doing more for composers, both men and women. Particularly when you work in opera, you don’t see anything new going on here. The New York City Opera is doing Broadway shows right now; South Pacific is on for quite a run, as you probably know, and the Metropolitan finished off with Gershwin’s wonderful Porgy and Bess two years ago. And that’s just been about it. Of course they want to play the sure-fire things, which are always the classics, so it’s rough all around for everybody, not just the women. BD: What can we do to change the situation, to get more performances of more contemporary works by American composers, both women and men? JS: That’s hard to answer. I’m not sure that you can get it with the big orchestras. The American Composers Orchestra does the best, but that’s a little hard for women to get performances. I don’t know of more than one woman that’s had a performance, and I didn’t hear hers. They do play American works, but those are mostly BMI composers on their programs rather than ASCAP. Maybe we should get us an orchestra. [Both laugh] I doubt that they would do that, but they do help, undoubtedly, with donations. I’ve participated in concerts where they did contribute funds, but not a whole orchestral concert to my knowledge. BMI sort of does that, and theirs are interesting. Dennis Russell Davies is the founder of that orchestra, and they play most interesting works. [Note: Davies and Francis Thorne founded the orchestra together in 1977, and Davies was its conductor until 2002. See my Interview with Francis Thorne.] I heard them play The Chairman Dances by John Adams, and that was quite interesting. I really liked that. It’s the only piece of minimalism that I thought had anything to it, and that was quite, quite good. BD: This is a good time to ask one of my favorite questions. Where is music going today? JS: It’s probably on the way back. There are the extremists, the extreme simple ones that would take in that minimalism of Glass and the others that are quite prominent. Then on the other end are the ones that went off on the twelve-tone system, Babbitt and Wuorinen and those people who are the other extreme. [See my Interview with Charles Wuorinen.] I don’t think they’re being played as much as they were and the best part is that they’re not being imitated as much. That’s the secret. If only the Americans would just have a little confidence in themselves. It’s all right to have observed what these people have done, but why copy every new trend that comes along? What is that? Don’t they have anything of their own to say? In today’s New York Sunday Times, in the music section there’s a marvelous article by Ned Rorem, delivering a solo on the state of music! He really condemns all of these people. He said he never had to come back. What they’ve done is to return from having delved into the twelve-tone system too far, but they’ve begun to come back slowly. So it looks like that there’s a trend of trying to communicate, at least with audiences at the Philharmonic. My subscription is on Fridays, and if the contemporary piece comes first, most of the audience waits and comes in after that’s through. BD: I would think the best place for a contemporary piece would be the last thing on the first half. JS: But they go out, then. They go out and stay out, and then come in at the intermission. I sit through it all because I want to hear it all! BD: Of course, as do I here in Chicago! So how do we get the audience to be more open-minded about what they listen to? JS: That’s a particular audience. They’re the ones that support music, and to make that audience angry would be for the Philharmonic to go broke! What they have to do is cater to the taste of the regulars. The young people will attend concerts sometimes, but they are more interested in all these new things. I don’t think they have much background, or they wouldn’t listen to that exclusively. I hope they do have some background and listen to both. If I were their age now, I would listen to all that I could. And I think they are doing that with small concerts that are in churches, and at Symphony Space or at the 92nd Street Y. There’s a lot of new music which goes on there, and the prices are much cheaper than going to a concert at Tully Hall or the Philharmonic or the Metropolitan. Of course the Metropolitan plays it safe, too! They haven’t done anything since Porgy and Bess and they’re not likely to. They’ve got to play the sure-fire things that will make a sell-out every performance because their expenses are so high. BD: It seems like there are so many factors weighing against the decision to do new pieces either in concert or in the opera house. JS: Yes. Oh, absolutely. But it always costs so much more to mount anything new, and there are more rehearsals always, too. There was one opera that I heard at the Manhattan School, The English Cat of Hans Werner Henze, which I liked very much, except it was too long in places. [Both laugh] And he had cut it already! They said twenty-five minutes had been cut, but he could have still done more. I think the second act is the one that’s so long. Another mistake was that all during the intermissions, music kept going, so your ear never has a chance to rest. It’s a mistake in that opera. But it’s a very interesting work. It was cute seeing these people all dressed up like cats. I liked it better than the musical playing downtown, Cats, which only has one good tune, "Memories." JS: I’m successful in that of my six, they’ve all been done and done a considerable number of times. BD: Is that not what constitutes a successful composer? JS: Well, partly. Let’s see, six — that’s not nearly what Menotti has done. He’s leads the pack with all his number. [See my Interviews with Gian Carlo Menotti.] I’m sure he has probably at least twenty or more, but he got poor reviews when he brought back Amelia Goes to the Ball last week. I was down in Miami so I missed that, and also Tamu-Tamu, which I’ve never heard. He got low marks in the papers! I heard the first performance of Amelia in 1937. Mr. Hutcheson, the President of the Juilliard School, gave the composition people tickets, so we got to hear it. We thought it was charming and just lovely, but the Times would have nothing of it. I think that they have been so mad at Menotti for Goya that he’s going to probably catch it every time. BD: Let us talk about your operas. You have the six of them, and the first one was Cynthia Parker. JS: Cynthia Parker was in one act with a spoken prologue. I revised it quite a few times over the years and made it into a three act opera. I just never could leave it alone. While I did the others, I always came back to Cynthia Parker because the story is so marvelous that I felt I wanted to leave that in good shape even if none of the others were. The three act version was done in 1985 at the University of Texas in Austin. We had four performances with orchestra and six with two pianos in a smaller version for the school children. It was a Texas story and we were celebrating the sesquicentennial. That went awfully well, even with the two pianos. Somehow the understanding between the stage and the pit was a little sharper! [Laughs] Of course you never have enough orchestral rehearsals, but by the fourth performance it was good with the orchestra. So that one is successful. The second opera was The Stranger of Manzano, which is based on a folk legend of New Mexico. Gershwin had had this great success with Porgy and Bess, so one of the music critics in Dallas wanted to write a book for me. He and I selected that story. He suggested it from Frank Applegate’s collection of New Mexico folk legends. I certainly wouldn’t want to try another black opera after the success of Porgy and Bess, but we still wanted to keep it American. I had already done a kind of what you’d call an “Indian” work, so that left us the Spanish to have a chance with. And that was quite well done. We had Mary McCormick as the stage director, who had been with the Chicago Opera during the time of Mary Garden. She was quite a singer herself, but by that time had finished her own singing and was a wonderful stage director. We had a great success with it. The trouble was that there were two Dallas critics, one from the Dallas Morning News and one from the Times Herald. The man that wrote with me was from the Times Herald, and I didn’t know about their feud. This was around 1945 and I was still studying at Juilliard. It was performed in 1946, so it must have been a little before that. BD: So you got caught in the middle of it? JS: Well, the Dallas News killed both of us — the writer and me too, so I just didn’t bother with that one any more. But I’m going to take that up some day because there’s nothing wrong with the work; just the inclination to do anything after that squelching was so awful! But then I also had a chance to write The Gooseherd and the Goblin, a commission from the Hart College of Music. So that took my mind off of the second opera, and I got busy on the third, which was first performed in ’49. That one had a radio premiere, which was somewhat unusual. Herman Newman had The American Festival every year in the month of February, and I think my Gooseherd was the first premiere he ever had. He was most proud of that. When it was staged, the director had marvelous ideas. It went touring and had many performances. They put the one set in a station wagon, and when they didn’t use the ten-piece orchestra, they played one piano, four hands. I did the arrangement for that, so that did awfully well. The next one, called Cockcrow, was by the same writer that did The Gooseherd, Constance D’Arcy Mackay, who was the wife of the youngest brother of Henry Holt of the publishing company! She was very much a writer herself, and she sought me out, which was nice. After my first opera, writers began to seek me out. They had ideas for operas, and they thought I would be a good one to approach, since I’d had one that had a success. The Shepherdess and the Chimney Sweep was written by Mrs. Holt, too. Her professional name was Constance D’Arcy Mackay, and we decided to use her initials, C.D. Mackay. She thought they’d think one of us was a man and we’d have a better chance at production! [Laughs] It had a marvelous presentation in Fort Worth in the regular season, and for Christmas they did five performances. Then the last one was Daisy. That was the most elaborate production I ever had, and I was paid quite well because it was commissioned by the Greater Miami Opera. I remember the copying and preparing of the parts cost $3,000.00, which was quite a lot of money. We had to have three directors. The first one, Arturo di Filippi [who had founded the Miami Opera in 1941], unfortunately, died rather suddenly and was replaced by a second man. Finally Robert Herman, who had been Bing’s assistant at the Metropolitan and knew everything about opera [and who took over the directorship of the Miami Opera], did the production. He told me they spent $83,000 on the production. We had young singers including Elizabeth Volkman, who had sung at the Met, and David Rae Smith, who sang at the New York City Opera. They are both on the recording. The work has had many performances, not only the three at Miami, but also North Carolina, Birmingham, Alabama, Detroit and Rochester, New York at the Eastman Theater, which was quite a performance. That’s all I can think of right now, but it’s also had a lot of little performances, probably where they just used the piano. BD: Was it special for you to write about the Girls Scouts of America, something that is still going on and is very important in the hearts of so many women? JS: I was not a Girl Scout. 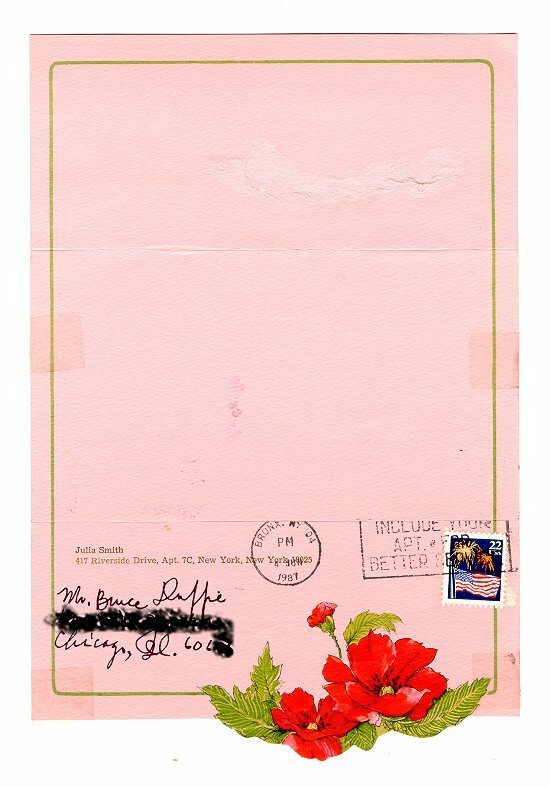 They sent me a libretto first that was so pink tea-ish and so girly-girly, that I turned it down. I said I couldn’t do it, and I wouldn’t recommend anyone to do it. The Girl Scouts office had approved it, but I said it would never be successful. So then they let me pick my own librettist and that was Bertida Harding. I got fascinated in the study. I read all the Girl Scout books and got fascinated with Juliet Low’s life, and also with Baden-Powell. After an unhappy marriage, she found something to work at that gave her a reason for trying to achieve something that amounted to something. I felt very idealistic about that opera. 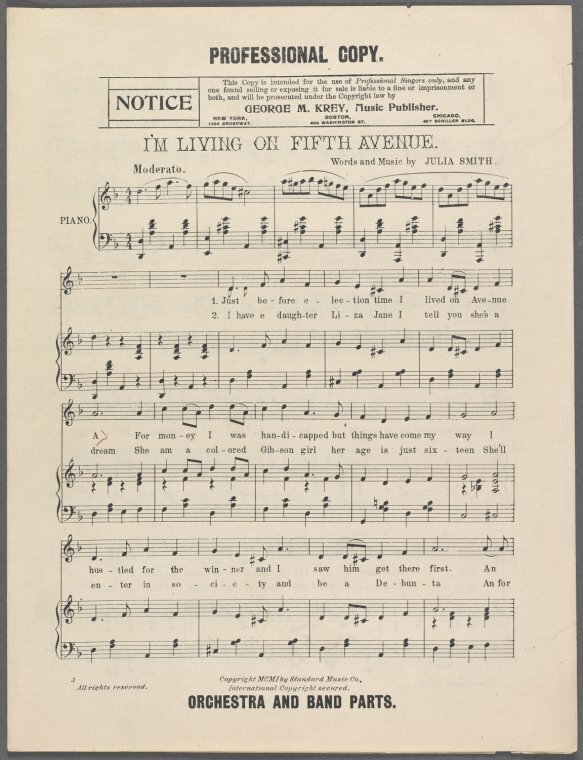 It was a wonderful thing for movement to have happened to the girls in the United States, and I wish I hadn’t been so busy practicing the piano when I was eight! I could have been one because I always loved sports. They stress that along with tying knots and all kind of activities. It was a real inspiration. The more I got into it, the better the music became, I think. BD: Is this a “number opera”? The excerpts on the disc total twenty-one pieces, and I’m just wondering if these were taken out of a through-composed piece, or if each one was an individual number in the work? JS: It’s not so numbered. I used the titles of each section because I thought it would be helpful to them and to others. If they wanted to, they could take segments for their individual groups to do in their troops in their music programs. But all the music had underscoring. If there was any spoken language, it wasn’t their speech. There was underscoring — soft strings or something to back that up, so that there was a musical continuity all the way through. BD: So it’s not just an opera for Girl Scouts; it’s an opera for everyone. JS: Oh, that’s right, and for parents! It’s one that the whole family can go to. The parents would often go with the children, and some of the parents never had been to an opera before! So it was a good thing to do, a practical thing. And I think it has moments that are touching. BD: Do you feel that you are a role model for many of the Girl Scouts who hear the opera? JS: [Laughs] That’s a big statement to claim! When Meet the Composer sent me up to Rochester, I talked to the little girls — well, they weren’t all little — but when they wanted to know something about my life, I remember saying that I had been one of seven children in my family. I said that I thought it would be a little more interesting, maybe, to write seven operas instead of having seven children. I planted a little seed of thinking about something besides just getting married and having your children and being a housewife forever. That seemed to interest them very much. BD: Do you view your operas as your children, especially because they are such major works? JS: My husband was a creative person too; he was an engineer for the Sperry Company, and he did many inventions for them. So we had a pact when we married. I was studying in the Juilliard School, and I said, “I’m studying to be a composer and I intend to do that in my life.” He said, “I want you to. I’m doing things all the time, too.” We didn’t want to have our work be interrupted or cluttered any more than the usual cluttering that takes place, so we were mutually agreeable to take steps not to replenish the population. We felt there were enough people busy at that, and the world didn’t need our help in that way. Maybe that’s a far-out idea, but it was a very practical one for me and for him. BD: It’s an idea that is rather popular today, but you did it before it was in fashion. You’re a very forward-thinking woman. Has this contributed to your composing, the fact that you are a forward-looking person in all aspects of life? JS: Oh, I think so. Absolutely! I do have, sometimes, startling ideas; they even startle me! When it is the right time to do things, and you have to seize the opportunity. That’s why I thought of bringing out the revised version of Cynthia Parker for the Texas sesquicentennial. The time was right, so why wait any longer? You do have to think of the timeliness of something and watch for your chance and do it then, because that’s the only one you’re ever going to get if it’s at the right time. BD: What other advice do you have for young composers, either young women or young men? JS: I think that they should get a thorough grounding. It never hurt anybody to know something about harmony and counterpoint and fugue. I know Goldmark wouldn’t accept me as a graduate student with a fellowship at Juilliard until I did the fugue. Of course, I don’t know anything about the popular field. I’ve written some light songs and, in fact, I have maybe a Broadway touch in a lot of things. Certainly it is there in Daisy in places, but knowing something of your craft never hurt anybody. You don’t have to write correct four part harmony if it doesn’t suit you, but you should know why you’re not going to do it, rather than just blunder ahead with a smattering of something, or picking out tunes that somebody else has to orchestrate. You have to learn the craft if you’re serious about becoming a composer, absolutely! BD: In musical composition — your own or in general — where is the balance between inspiration and craft? JS: I like to work every morning from nine o’clock to one o’clock, and that’s a habit. If you sit there long enough, the inspiration comes! Sometimes it comes and you don’t have to sit there; you’re thinking of what you’re writing it for. If it’s an orchestra piece, you can think of it when you’re taking a walk and get the theme. But the main thing is to get something down, even if it’s only two bars or a motif or something, and you don’t have to be at the piano to do that. It just comes when you’re thinking about the work. Even if you aren’t thinking you’ll get ideas. The thing is to put them down. That’s why Beethoven always carried a notebook. A lot of composers do. In fact, I used to. BD: Do you work on just one thing at a time, or do you have a couple of projects going simultaneously? JS: You can orchestrate. That’s separate, something that’s already done, but if I’m going from scratch, I like to stay with that because the focus is more direct if you don’t divide your mind. But if your mind is tired after, say, four hours, you can still orchestrate because that can be mechanical, in a way. If you know the instruments’ range, that can be done with a more relaxed concentration than striving to get measures written that are yours and not somebody else’s. BD: When you’re orchestrating, is it almost like you’re working with somebody else’s music? JS: No, because I indicate. When I’m writing, I use four staves to jot down thoughts for the orchestration. You can fill those in a little bit as you write the piece. It’s better to take four staves than just two, even though you may use the piano only to work. Stravinsky said that music has become so complicated that it’s better to work it out at the piano, but some do and some don’t. BD: Have you basically been pleased with the performances that you have heard of your music? JS: Yes, for the most part. The ones up in Buffalo that I had last year were wonderful; all the piano works by this wonderful two-piano team, and they really celebrated! I didn’t know and they didn’t know that it was my 75th Anniversary, which it was, but they said no, they didn’t think of that. They didn’t even know that I was born in 1911, but they liked my piano music, and that’s why they did it! So that was awfully nice to have. Buffalo is quite a place for new music. That’s one of the best interior places in the country for new music. BD: Yes. It has been for a long time. JS: I didn’t know that until I found out last year. On the other hand, a production of Daisy that was done at Birmingham, I didn’t like the way they conceived it. It’s the stage director’s fault. He made a comedian out of Lord Baden-Powell. It is pronounced Poll, not Powell, and the character who played him was a funny old kind of fool, a comic. He shouldn’t have been that way. I told them that I was very displeased about that. BD: Did they change it, or no? JS: They couldn’t. I heard the performance later. How could they change it? I don’t know if they ever did it again or not. BD: I thought maybe you had heard a rehearsal or the first performance. JS: No. We didn’t go; I wasn’t invited! You can’t go unless you’re invited! They probably were afraid there’d be something; they’re always scared where women are involved! If we don’t like something, we’ll hit the ceiling or something. I never did that in my life. But I told them afterwards that I wouldn’t want anyone to see that interpretation of it, because it’s not correct. He was a Lord for the Queen, and they don’t act like that. At least he didn’t. BD: How much leeway do you allow in performances of your music, either the operas or the concert music? BD: Do performers ever find things in your scores that you didn’t even know you’d put there? JS: I’ve found something in Cynthia Parker myself. When I was listening to the first rehearsal, a phrase from Un Sospiro of Liszt was there. I asked the director, “Did you hear that?” and he said, “Oh yes, we noticed it.” I never noticed it. I hadn’t heard that played before, but I never noticed it in the writing because it was just in the orchestration. BD: There have been recordings made of the excerpts from Daisy and also the String Quartet. Are you pleased with those two? JS: I think I made a mistake with the selections that were done from Daisy. I really should have talked to the conductor more about it, but we were having such a battle with the union! That was a Ford Foundation grant — both of the recordings were — but there was a quartet I already knew, so we used them. But with the opera, I should have included more of what we selected because we didn’t give them any nice orchestra parts to play. For instance, “Liza Jane” is in there. That’s entr’acte music and it was a commissioned piece from CBS, but it would have been nice to have that on the record. I was trying so hard to get the whole story in there, so I’m not as pleased with all of the music that was in there because there’s not enough orchestra by itself. It didn’t show off some of the best music that was not singing. There was omission of orchestral segments that I wish had been in there, and I think there would have been time... except when they say you have fifty minutes, you get awfully parsimonious about how you spend that time on certain things. Then we spent time taking out the lovely orchestration. It’s well scored in “When Love is Gone,” the aria that she has. There’s a nice place before the repetition, and I had that taken out. That was a great mistake on my part to have done that. After we had it on the tape I had them take it out because I was afraid there wouldn’t be room enough left. I thought if we didn’t cut as we went it would be a mistake, and that’s due to my inexperience. The record as a whole gives a pretty good idea, but it could have been better, and the fault was mine. BD: How much of the opera is there? JS: Fifty minutes. With Daisy, sometimes I like it better if they don’t do the third act. JS: It can be done that way because there’s the folk song which makes it a little long. I don’t think it’s on the record, because I would have sacrificed the folk song. It makes a better ending without showing her death. BD: The record ends with “We’re On Our Way,” the finale with Daisy and the girls. JS: Yes, I like the finale. That’s with all the little Girl Scouts, but before that there was a Scotch folk song. There’s a big scene at the end of the second act where they had an international Girl Scout event. That’s a good place to end the opera by using all of this last chorus in place of the one that’s there. Somebody did it and did it real well; I think it was in Detroit they did that, and I like that. So it depends on how people feel about it. There’s some leeway there that you could do it or not do it, and it makes it less long. For instance, Henze says that in connection with the English Cat, when they told him it was too long and he had to take some out, he said, “Let us talk it over.” So then they talked it over and he took out twenty-five minutes. They didn’t expect him to take out that much! Somehow, when you get with the director, you see these things. I spent a week in June with them in Austin just doing that, and the production wasn’t until December of that year. And I found places. When you talk with them and you see how the staging might work, then you’re more amiable to the suggestion of cuts. JS: Yes! [Laughs] I think it works almost better there than in the opera house! For instance, with Goya, Menotti’s latest, which got such awful criticism in Washington, a friend of mine made a copy for me. I heard it first on radio without any of those subtitles, and it didn’t mean as much to me. Then the next day, when we played the video and I heard it and read the titles, it was perfectly clear! I couldn’t see how the critics had been so dumb — they must know that you can’t understand what singers say in any language. You might get a few words here and there, but you can’t follow the story. Maybe the best opera to come is going to be on television, because if they’re going to keep on building these mammoth houses, they can’t do anything but the mammoth works that have already been written. They can keep Wagner up forever and all the Verdi and Puccini because everybody knows them. Of course, I love all of those scores, but for new opera, maybe television is going to be the way. BD: Might you write something specifically for the television? JS: Would I? Well no, I’d rather write for the opera house, but a smaller theater — and have the subtitles like they have at the New York City Center. I would like it there, and that’s a big house, but not as big as the Metropolitan. BD: For you, where is the balance in opera between the music and the drama? JS: I think they have to help each other. It is less good if you hold up the action. For instance, Dr. Nagy suggested putting in little places in The Gooseherd and the Goblin so that you could do a little stage action, whereas Dr. DeSimone, in Cynthia Parker, wanted to tighten it up and move right along to keep the drama and do the action while they’re singing. I think they do more of that now than they did twenty years ago — they hop around and sing at the same time, which a lot of singers don’t like to do. Jessie Norman won’t do that. She stands there like the Rock of Gibraltar and pays no attention to what the stage director told her to do. She says yes, and then just goes on standing there. She does it and sings and we like that because you can hear what she says. And she’s very imposing. BD: Let me ask you about the string quartet. That’s the other piece which has been recorded. JS: Yes. This quartet I knew here in New York had played it in 1964. They did the first performance, so I was pretty well pleased with their work. There was one repetition of the B theme in the slow movement that might just as well have been cut. It’s not much. It was a repeat of what had been done in the recapitulation and might have made it a little tighter, but I only learned that after I’d done this business of the cutting session in Austin. I learned what you need to do from that, but I don’t think anybody else would necessarily think a cut was needed because it’s pretty well-balanced. JS: Yes! I think so, because I even found a minimalist piece, as I told you, that I liked! [Laughs] I agree with everything that Rorem said in that article today. He says that he never did go through changes of style. He’s a friend of Virgil Thomson, and they always wrote the same way right through. [See my Interview with Virgil Thomson.] They didn’t run off with the Schoenberg twelve-tone business and have to come back. He also says that the art song died in 1955. I remember when that happened, all the publishers threw out all the American art songs because they weren’t selling. I think that must have been about the time that Elvis Presley was hitting it big. Maybe that was the reason, because of the songs he sang. He was a good singer, to my way of thinking, of popular music. He really knew how to sing; he had a voice. I heard voice teachers really think that he was just the best of all of those people that were coming along. He had the best voice. I don’t know exactly what it was, but the publishers just weren’t selling enough of our songs. By word of mouth I found out that they were going to throw those out, burn them up, so I got some of my songs and a lot of other composers got theirs, too. BD: You rescued the copies? JS: Yes. There weren’t many. Some of the other composers probably didn’t take all theirs, but they took whatever they wanted. BD: You’ve been involved with music all your life. BD: What is the most surprising thing or most surprising change that has occurred over the last forty or fifty years? BD: That they are making more strides? JS: Oh, sure! When I was growing up, there just weren’t any. The nineteenth century had three — Clara Schumann, Fannie Mendelssohn, and Louise Ferrenc. We should have a lot more. Incidentally, the thing I have enjoyed, as much as I have my writing, is that I played all the piano works of Aaron Copland up to the Fantasy. I was happy to give up my vision to be both composer and pianist after having played his works in the large universities, and also in the three large ones in Puerto Rico and a lot of museums here. I never wrote any more solo piano music after I played his music! I didn’t see any way that the piano could be used expressively if it was to be like that. Isn’t that funny? BD: That is. That’s very strange. JS: I liked his music and I liked playing it, but somehow, with the twelve-tone business it was a surprise that everybody started doing that. I wrote one work like that and then that was it for me. I wouldn’t do any more. BD: You tried it and didn’t like it. JS: No. I didn’t like the sound of it. And I thought with opera, you have to be reasonable about what you ask singers to sing. Why make it excruciating? A lot of it is excruciating sounds. For instance, to hear Lulu is still excruciating. The second time I liked it better than the first. Wozzeck I like. I’ve never heard Moses and Aaron yet, and those, I guess, are the three big works of the twentieth century. But they have a long way to go before they are accepted, really to be in the repertoire. BD: This has been a fascinating hour speaking with you. I appreciate your taking the time from your schedule to allow me to probe your mind. JS: I hope I spoke intelligently. BD: Oh, very much so. And I want to thank you for being a composer. JS: Well, thank you for respecting me as one. I would like to add that I have enjoyed my volunteer work. I didn’t volunteer it; they got me to do it. To work on behalf of women composers in the Federation, through the avenues of the Federation, has been one of the great joys of my life. I continue, wherever I get a chance to suggest a composer, to try to suggest a woman because we are so behind and the opportunities are so few. BD: Eleanor Remick Warren is another composer that I’ve spoken with. JS: Yes, and she’s a great friend of mine. Well, you’re just wonderful, and of course we do have men who are willing to give us a chance to be heard. And we can certainly count you! BD: Thank you so much. I do what I can. JS: You do wonderfully. My two favorite composers you mentioned, Louise Talma and Miriam Gideon. Those, in my opinion, are our best! BD: And they had eightieth birthdays within a couple of weeks of each other! JS: I know it. I heard both the concerts, and a lot of smaller ones leading up to it. We were so proud of them. SMITH, JULIA FRANCES (1905–1989). Julia Frances Smith, composer, concert pianist, author, and advocate for women composers, was born on January 15, 1905, in Carwell, Texas, to James Willis and Julia (Miller) Smith, who were both musical and who encouraged their daughter's obvious musical talent. During her teens she studied with Harold von Mickwitz at the Institute of Musical Art in Dallas. In 1930 she earned a B.A. in music from North Texas State Teachers College (now University of North Texas), where she composed the school's Alma Mater. She then moved to New York for further study and remained there. She studied piano and eventually composition at the Juilliard Graduate School (1932–39), where she earned a diploma. She also studied at New York University (M.A., 1933; Ph.D., 1952). From 1932 to 1942 she was pianist for the Orchestrette Classique of New York, a women's orchestra founded by Frederique Petrides. The group premiered several of her works. Smith studied composition at Juilliard after completing her master's degree at NYU, first with Rubin Goldmark and then with Frederick Jacobi. During her career she wrote in practically all musical forms for ensembles large and small. It was her success in writing in the larger forms and getting them performed, however, that set her apart from earlier women composers. By 1934 she determined to write her first opera, Cynthia Parker, in honor of the coming Texas Centennial. Although the premiere of the work was delayed until 1939, it brought her to national prominence and was only the first of six operas she wrote. Many of her works incorporate folk melodies and dance idioms within a relatively conservative, tonal harmonic palette, although she was not afraid of dissonance. The accessibility of her work to a wide audience aided the success of her compositions. On April 23, 1938, Julia Smith married Oscar A. Vielehr, an engineer and inventor who wholeheartedly supported his wife's career as a composer. Beginning in 1935 Smith took up a part-time teaching career, first at the Hamlin School in New Jersey. A few years later she taught at Juilliard (1940–42) and then as founder and head of the department of music education at Hartt School (1941–46). She also taught at Teachers College of Connecticut (1944–46). The decade of the 1950s marked the beginning of her writing career with the publication of her revised doctoral dissertation: Aaron Copland: His Work and Contribution to American Music (New York, 1955). This book, the first detailed study of this important American composer, received critical acclaim. Smith also performed numerous lecture–recitals featuring Copland's piano works in succeeding years. She later published Master Pianist: The Career and Teaching of Carl Friedberg (New York, 1963) as a tribute to her teacher at the Juilliard School. The decade of the 1950s also marked the beginning of Smith's vocal advocacy for the woman composer. In 1951 she spearheaded a New York recital of works by Marion Bauer. In the late 1960s she and Merle Montgomery planned a concert of chamber music by American women composers for the Musicians Club of New York, dedicating it to the National Federation of Music Clubs in honor of its efforts on behalf of women composers. This began her association with the NFMC and its programs. She was appointed chairman of American Women Composers, a post that led to the publication of her Directory of American Women Composers (Chicago, 1970), a pioneering work that appeared just as the women's movement of the 1970s was getting underway. She also chaired for the NFMC its Decade of Women Committee (1970–79) and in 1972 and 1973 arranged two thirteen-week series of national broadcasts of works by American composers, almost half of them women. Although her work on behalf of other composers encroached, Smith still managed to continue her own composing career. She wrote a work for the inauguration of Lyndon B. Johnson in 1965 (Remember the Alamo!) 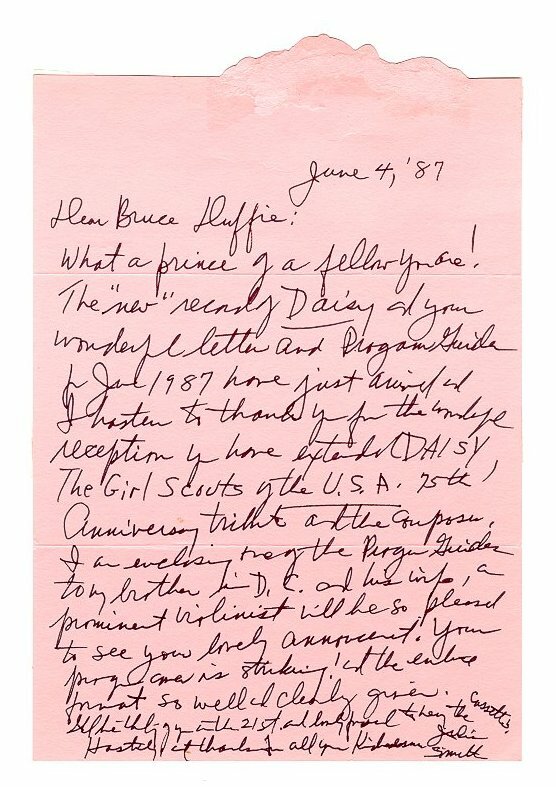 and her final opera, Daisy (1973), based on the life of Juliette Gordon Low, founder of the Girl Scouts in the United States. In the end, however, her importance as an advocate for the plight of ignored women composers may have overshadowed her own career as a composer. Smith died on April 18, 1989, in New York City while preparing to return from New York to Fort Worth for a performance of her opera Cockcrow. Her husband had preceded her in death in 1975. She was buried in the family plot in Denton. Christine Ammer, Unsung: A History of Women in American Music, Second Edition (Portland, Oregon: Amadeus Press, 2001). Jane Weiner LePage, Women Composers, Conductors, and Musicians of the Twentieth Century, Volume 2 (Metuchen, New Jersey: Scarecrow Press, 1983). Stanley Sadie, ed., The New Grove Dictionary of Music and Musicians, 2d ed. (New York, Grove, 2001). [Note: See Bruce Duffie's Interview with Stanley Sadie.] Nicolas Slonimsky and Laura Kuhn, eds., Baker's Biographical Dictionary of Musicians, Centennial Edition (New York, Schirmer, 2001). This interview was recorded on the telephone on May 3, 1987. 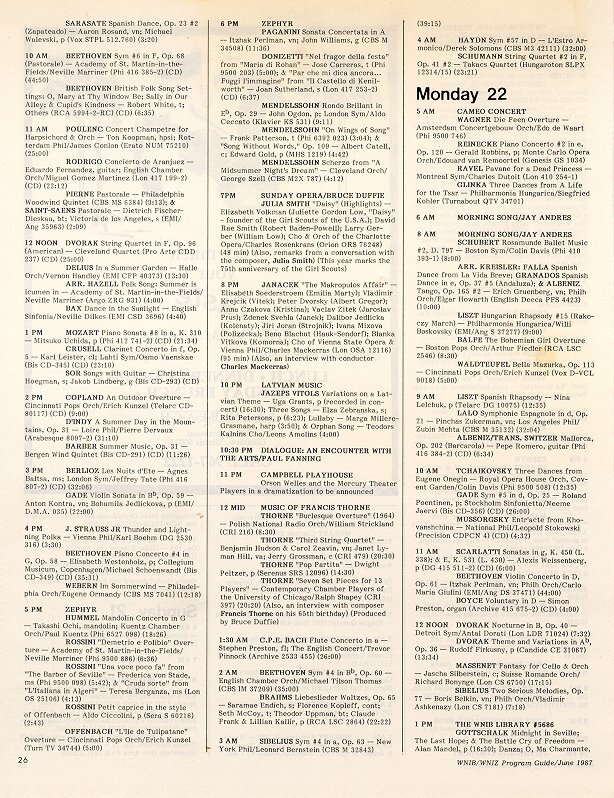 Portions (along with recordings) were quoted from the conversation on WNIB the following month, and audio excerpts were aired with recordings in 1991 and again in 1996. A piece of her music was included as part of the in-flight entertainment package aboard Delta Airlines in 1989. This transcription was made and posted on this website in 2012.